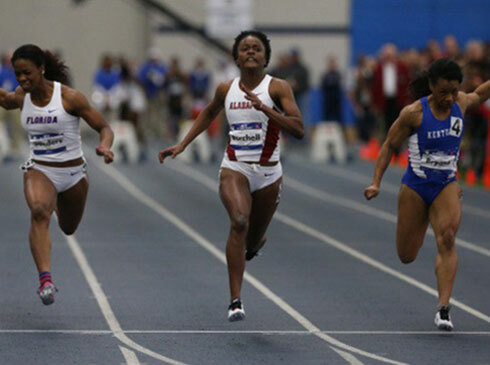 University of Alabama senior sprinter Remona Burchell of Jamaica set a collegiate record in the women’s 60m dash on Saturday afternoon (28th) while winning the event at the 2015 Southeastern Conference Indoor Track & Field Championships at Nutter Fieldhouse in Lexington, Kentucky. Burchell, the 2014 NCAA indoor 60m champion and the 2014 NCAA outdoor 100m champion, dominated a world-class field in the 60 on Saturday on the campus of the University of Kentucky, running a time of 7.08secs. That mark lowered the old record of 7.09 set by Angela Williams of Southern California in 2001 and tied by Lakya Brookins of South Carolina in 2011. It is the second-fastest 60 run in the world so far this season behind a 7.05 by Murielle Ahoure of The Ivory Coast. Burchell beat the field by a full tenth of a second as Kentucky’s Dezerea Bryant, the 2014 SEC 60 champion, was second in 7.18 with Shayla Sanders of Florida third in 7.25. Lady Tiger senior Tori Bliss made it a perfect 5-for-5 when she unleashed a throw of 60ft-1in on her very first attempt of the women’s shot put competition to smash the SEC Indoor Championships meet record and capture her first career SEC title in the event in Friday’s (27th) opener at the Nutter Field House. Her winning streak appeared under threat when Missouri’s Jill Rushin opened with a monster throw of 56-11 ½ early in the first round of the second flight to set a seasonal best of her own. Bliss didn’t stop there as she followed with her second-best throw this season at 58-4 in the second round and a throw of 56-2 in the third round to maintain a more than three-foot lead over Rushin into the final. Bliss stepped into the circle as the clear favorite to take the title with an SEC-leading and school-record throw of 57-4 ¾ that was also set at the University of Kentucky at the Rod McCravy Memorial Track & Field Meet back on January 24. He throw on Friday shattered the 5-year-old SEC Indoor meet record of 59-4 ¼ posted by Florida’s Mariam Kevkhishvili in 2010 and made Bliss the No. 7-ranked women’s shot putter indoors in collegiate history. “Finally! It’s a relief more than anything,” Bliss said of her reaction to seeing a 60-foot throw pop up on the scoreboard for the first time in her career. “That’s not the first time I’ve thrown 60 feet, so I knew I could do it today. I had a warm-up at Arkansas that went 60 feet, I had one yesterday when we came here to the track that went over the 60-ft line, I had one in the warm-up today that was the same thing. Texas Track and Field made it a clean sweep on Saturday (28th) in winning the men’s and women’s Big 12 Conference Indoor Championships in Iowa. The women’s team went toe-to-toe with Kansas State throughout the meet and pulled off the victory over the final four events by 6.5 points. The Longhorn men won by more than 40 points to give Texas its first sweep at the Big 12 indoor meet since 2006. “We obviously knew coming into the meet who our main competitors were going to be,” Head Coach Mario Sategna said. “We just had to come in, and yes, have our core group lead the charge, but at the same time we were going to ask a lot of them in doubling and tripling in certain events. Texas scored 139 points over the 19 events on the women’s side to hold off K-State’s 132.5, and the men dominated the field with 140 points. Oklahoma State finished second for the men with 95.5 points. The women saw the momentum shift in their favor in the 200m when five Longhorns scored to give them the lead over K-State by 7.5 points. Texas reclaimed that lead with Sandie Raines finishing fourth in the 3,000m for five points, after the Wildcats grabbed the lead in the triple jump. Going into the final event, the women’s lead over K-State was 4.5 points. As long as Texas hung close to K-State in the 4×400, the women would repeat as indoor team champs. 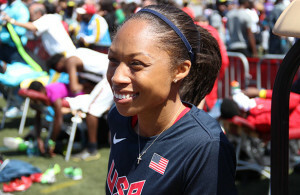 The Longhorns won five individual titles for the women, plus the 4×400 meter relay, while the men claimed four titles. Final team standing are: Women – 1. Texas, 139 points, 2. Kansas State, 132.5; 3. Baylor, 105; 4. Oklahoma State, 77; 5; Texas Tech, 75.5; 6. Kansas, 71; 7. Iowa State, 68; 8. Oklahoma, 52; 9. West Virginia, 16; 10. TCU, 5. Men – 1. Texas, 140 points; 2. Texas Tech, 95.5; 3. Oklahoma State, 94; 4. Oklahoma, 89; 5. Iowa State, 81; 6. Kansas, 80.5; 7. Baylor, 69; 8. TCU, 49; 9. Kansas State, 43. The 2015 NCAA Indoor Track & Field Championships are set for March 13-14 in Fayetteville, Arkansas. The ACC Indoor Championship returned to Clemson after a one-year hiatus. The women’s track & field team compiled 102 team points to outlast Florida State and Notre Dame to claim the school’s fifth indoor conference crown in the last six seasons. The Tigers had individual wins in the 60 hurdles in triple jump, and finished the meet in grand style, capturing the 4×400 relay with a meet and facility record. Samantha Elliott got it started in the former. The senior ran 8.17 — a personal best — to claim the 60 hurdles title. She later was third place in the 60 dash to wrap a great all-around day. Olivia James, Nia Fluker, Deja Parrish and Natoya Goule comprised the 4×4 that ran 3:32.87. Goule added a runner-up honor in the women’s 800. She posted a time of 2:03.57.